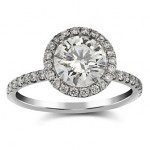 A halo engagement ring has a main stone set with several little stones surrounding it in a circle, or a “halo”. 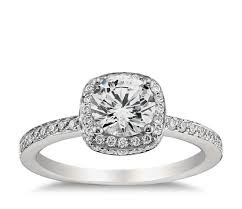 This style has been popular for engagement rings since the 1920’s and is still a common type of engagement ring. These rings are usually set with diamonds, but can be just as effective with other stones too. The halo engagement ring originated from the Art-Deco style engagement rings that have designs that focus more on geometrical shapes. The geometrical look and the simplicity of the halo engagement ring made it popular for those who want to give an expensive looking ring without going for the intricately designed styles. In the history of engagement rings, the popularity of the halo engagement rings went down because of the great depression, however, it became in demand during the 1960s when the economy started picking up. Some halo engagement rings are also coined as cluster engagement rings, because it is in effect a group of stones set closely together, but the halo engagement ring is different because it has a round center stone with smaller round stones surrounding it, giving it a halo look. The halo engagement ring has a few pros and cons. The surrounding halo of stones can frame the middle stone in such a way to make it appear bigger and improve the brilliance of the stone. This can make the ring seem more impressive and valuable by adding to the initial “wow” factor when you first see the ring. On the flip side, it is very difficult to create a halo engagement ring without decreasing the natural brilliance of the stones. Because there are so many stones of different sizes, it becomes difficult to arrange them to allow the light through at the preferred angle. This means some of the visual impact can be lost by a misaligned diamond. Also on a technical note, setting the small stones around the large centre stone requires very precise cutting, shaping and placing of the diamonds. Again, any small mistake or imperfection here can have a big impact on the visual impact of the ring. It’s not just the shape of the diamonds that can cause problems. Diamonds, as with any gem stone, are just as unique. Each one has a slightly different brilliance, clarity and colour. When arranging a halo engagement ring you need to match the colours of every stone as closely as you can to give you the desired appearance. If there is one stone that isn’t matched correctly it can ruin the overall effect of the ring. If you are looking for the perfect halo engagement ring to give to your future wife, then you should do your research duties carefully in order to get the perfect engagement ring! 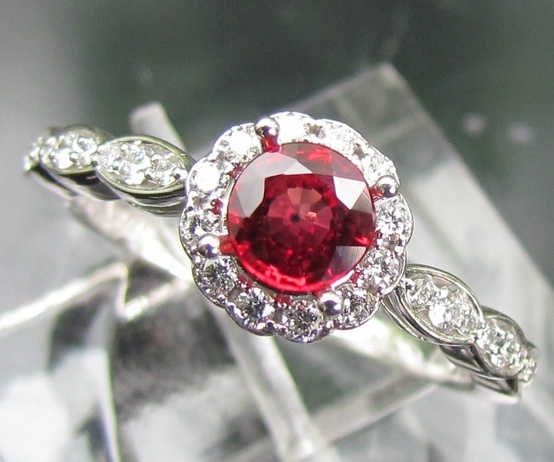 Above is a sample of a halo engagement ring that has a ruby as its center stone. Going for other gemstones has its advantages as you will definitely spend less on your halo engagement rings budget. The key in buying a halo engagement ring is going for the kind of settings that will ensure that you are not going to lose any of your stones. 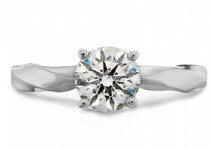 The common settings of the halo engagement ring are usually 4 to 6 shared prongs. Bezels are not a popular choice as it allows minimum light to come in the stones, and will definitely reduce the sparkle of your stones. It is also not advisable to go for a floating effect on this design because of its stability, since you are minding for the settings of many stones. 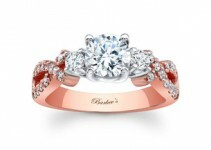 Maximize you savings by going for Bespoke Halo Engagement Rings! If you want to give your future bride something that you have put a lot of thought on without sacrificing a lot of money, you can go for bespoke halo engagement rings! This kind of engagement rings will give you a lot of options in terms of the gemstones to be placed, the quality of the gemstones to be set on the engagement ring, the size of the gemstones that you want on your engagement ring, the kind of metal , plus width and color of the band. However, going for bespoke has its own hassles, because you have to do your research carefully for the right combinations of gemstones and metals. For example, if you want to go for a ruby bespoke halo engagement ring, then you have to go for metal bands other than the white gold band to avoid damages on the ruby center stone (you can read more on this on our ruby engagement rings). You can do mixing of different kinds of gemstones, but to be safe, you can go for a diamond center stone, with other kinds of gemstones as the side stones that create the halo effect or vice versa. All you have to do is to consult your jeweler for the right combination that gives you the best value for your money. The picture above shows a cushion cut halo engagement ring with a thin band. This makes the stones look bigger, and will have a more expensive looking effect! That said, if done to a high standard a halo ring can be a fantastic choice to give you an impressive looking ring with lots of shine and impressive diamond shapes. 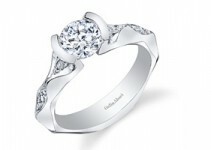 The halo engagement ring style also gives a nice traditional early 1900’s look which is coming back into fashion again.